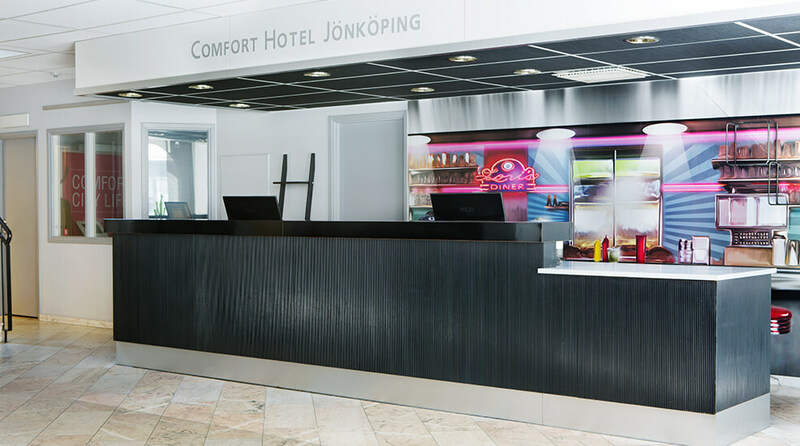 The Comfort Hotel Jönköping is conveniently located in the city centre, just five minutes from the Jönkoping Travel Centre and close to Jönkoping Airport. We offer conference facilities for up to 150 people, sauna and free gym. Comfort Hotel Jönköping is located in the centre of Jonkoping, near the university and Jonkoping Travel Centre. The shops on Klostergatan as well as a number of restaurants are also around the corner. Hold your next meeting, conference or event here at the Comfort Hotel Jönköping! We have smart meeting rooms in the city centre for up to 150 people. Read more about conference facilities here. There is free WiFi all over the hotel, so you can surf the web as much as you like! Exercise for free at Fitness & Friends, just 100 metres from the hotel. We have a number of rooms that are suitable for disabled guests, with good accessibility for wheelchair-users, for example. Please contact us for more information about these rooms and additional facilities. Do you want to know more about what's available at the hotel? Here are some of the most frequently asked questions about the Comfort Hotel Jönköping. The Comfort Hotel Jönköping is cash-free, which ensures added security for our guests and visitors. More information about this can be found under FAQs. Airport bus to Jönkoping Travel Centre, change to city bus 1 or 3, alight at Lasarettsparken. phone +46 36 12 12 12. When arriving by train, get off at Jönköping C train station.